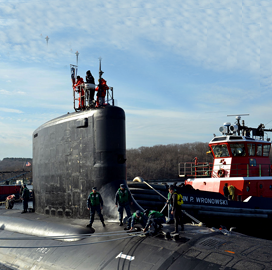 The Defense Information Systems Agency is seeking a contractor that could provide information technology support for the U.S. Navy’s submarine maintenance engineering, planning and procurement activity at Portsmouth Naval Shipyard in Kittery, Maine. DISA issued a sources sought notice Tuesday on FedBizOpps to present the required information management technology support services for the SUBMEPP program. The agency said it seeks potential vendors that can work on help desk and operations support, cybersecurity, software development and configuration, database management and Navy-Marine Corps intranet support. The selected contractor will mainly provide application development and maintenance support, NMCI, functional area management support, information systems support, operations support and information assurance/cybersecurity requirements support for SUBMEPP. Work will take place at Portsmouth Naval Shipyard and at the contractor’s preferred work space. Interested parties can submit responses to the solicitation through April 3.